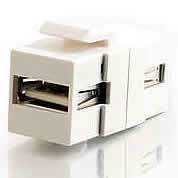 Feedhrough coupler for USB Type B male cables. 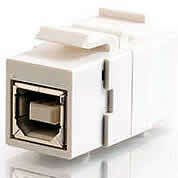 Use this coupler for USB Type B male cables; just snap it into patch panels, compatible wall plates and surface boxes. as a complete solution to extend a USB signal up to 150 feet over Cat5. One component of a complete solution that, when paired with a receiver (sold separately), conquers USB length limits. This patent-pending solution extends the signal of a USB device to a host computer up to 150 feet, enabling you to place your USB projector, interactive whiteboard, camera, printer, web cam, hub or other USB device exactly where you want it! 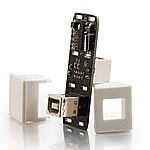 Our USB superbooster keystone insert is powerful yet simple, with no drivers to install or special software required. It's also compatible with any computer that supports USB. This plug-and-play device has a snap-in keystone type transmitter unit that works in conjunction with Cables To Go wall plates and surface boxes or any standard keystone and angled multimedia wall plate or patch panel. The overall plug-and-play solution consists of this keystone insert, and your choice of a compatible receiver that is sold separately: the 1-port dongle (#29350 or #29353), the 2-port Decora®-compatible wall plate (#29345), the 2-port dongle (#29346) or the 4-port dongle (#29347). Customize the configuration to your specific needs! 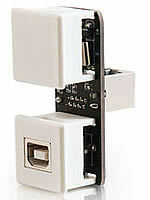 The complete solution is connected via a standard Cat5, Cat5E, or Cat6 UTP cable (not included) that provides easy in-wall installation. This delivers a clean, finished look important for homes, classrooms, offices and anywhere you don't want visible cables lying around. Use preerminated network cables, or pull unterminated. 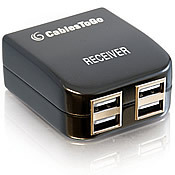 Because the USB keystone insert is bus-powered, no external power source is required. Compliant with USB specification 1.1.
up to 150 feet over Cat5.